What a fantastic day we had! We woke up in Trieste, Italy and took a walk before breakfast in the beautiful sunshine, along the waterfront back towards the hotel and breakfast in the dining room. By 9:30 we were in the car and now on our way, rather circuitously, to the Lipica (pronounced LI-peet-za) Stud Farm to see the Lippizaners. I was all but bouncing in my seat. As they say of the best plans … ours were not to be realized…Though we arrived too late for the 10 o’clock tour in English, there would be another at 11. But contrary to the information in the guidebook (I should have stuck with the website which was my first source of info) there are no training sessions on days when there are performances. I knew that Friday was a performance day, but the guidebook so highly recommended the training sessions, that I had rearranged our schedule to do the farm in the morning, as the training sessions are supposedly only at 10 and 11. A small setback to be sure, but immediately smoothed over by the discovery of an English speaking guide willing to take us on a tour anyway (something we had dared to hoped would happen!) So we got our tour first thing! The day was warm and sunny, and absolutely perfect day for touring an historic stud farm. First stop, one of the barns. Here the guide explained to us how were are to interpret the names identifying signs outside each stall. All of the stallions belong to one of 7 original bloodlines. There is a naming system that employs the sire’s bloodline name and the mare’s name (the mares come from 17 bloodlines). The horse is usually known by the mare’s name. But the real identifiers are numbers, and those in the know can identify the horse by his number. The horses were magnificent, even seen inside their stalls. They were also a little frightening. In the first barn was a pair of young stallions (4-year-olds) going at each other with a lot of kicking, rearing up and pawing, snorting and otherwise making a big fuss. These are enormous horses – averaging about 16 hands (roughly 5 feet) at the withers (the point where the neck rises out of the back), they are also extremely muscled and strong. Imagine how loud a kick from that is against a piece of wooden stall, with you standing right next to it…It is scary! We noted the coloring of the horses, how they lose their color as they age; from the dark black, brown or grey as colts to the snow white for which they are renown. 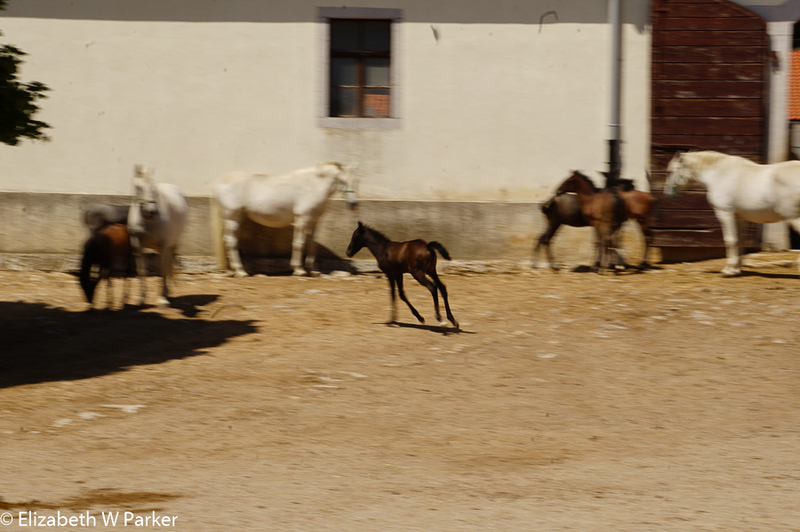 Our guide also explained that they no longer dispose of the horses who do not change color… something that happens once in a while due to a recessive gene combination. 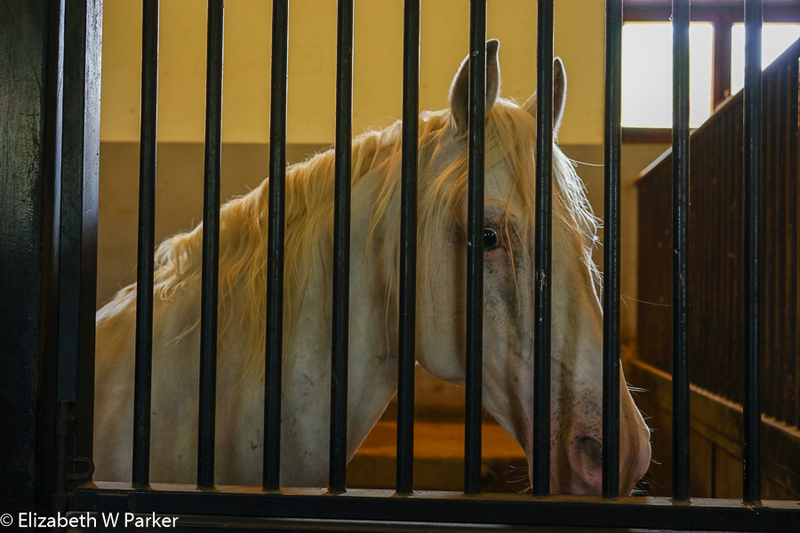 Though only the white stallions will ever perform, an adult horse whose color doesn’t change can still be bred to produce future white horses. Stallions who do not show promise in the training, may be sold intact or may be gelded to live out their lives as saddle horses. At the farm they use them for riding lessons. The Lippizaner is (usually) born dark and acquires the white coat with age. here’s a mare and foal. We also got to watch the mares and the foals in a paddock near the entrance to the farm complex. 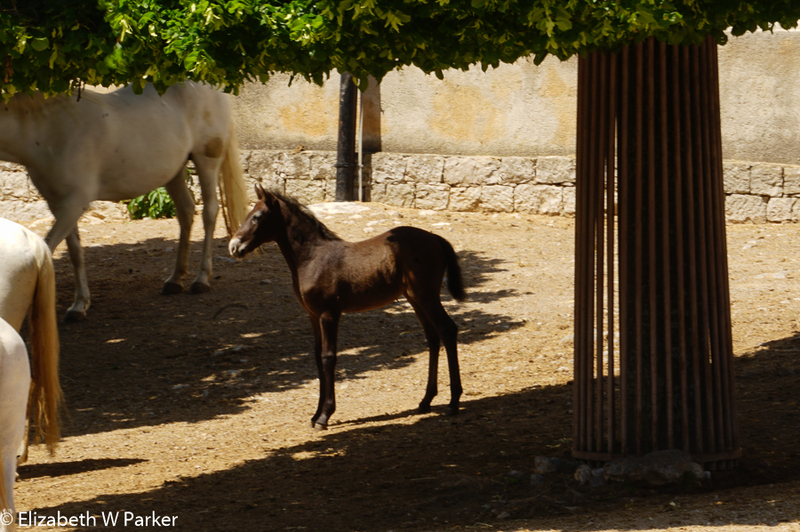 We saw a tiny foal who was just two days old, as well as larger foals, all shades of black, dark brown and even a dark mottled grey. Most stuck pretty close to mom, but the occasional renegade who would gallop on his long spindly legs, romping and caprioling, trying to entice the others to play, was mildly regarded by the collective mothers, much the same way a mischievous child is regarded on an urban playground…indulgently! The tour, of course, involves the historic buildings and more information on the culture of the horses. The lack of a training session to watch meant we did have a chance to visit the museum, which we went through backwards. If you go, try not to do that. Apparently the museum is arranged so that you go from dark to light, just as the horses’ coats do! 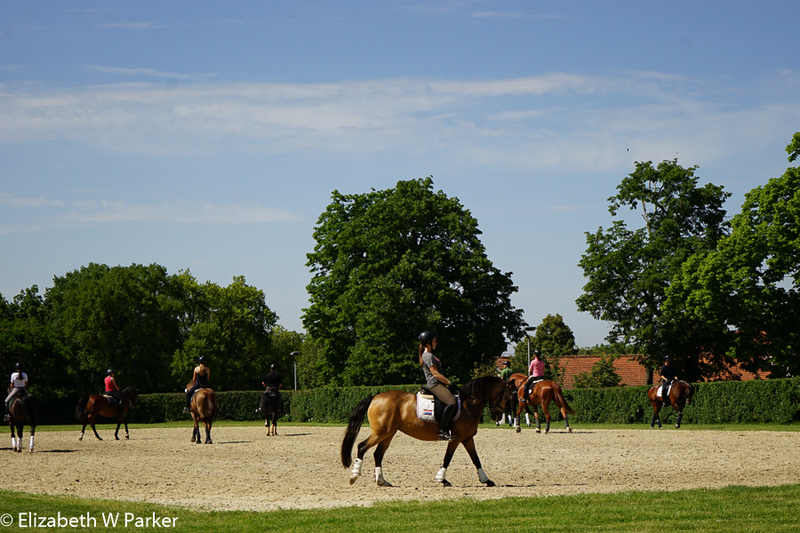 Riders practicing for the Olympic trial judging going on elsewhere at the stables. After the stud farm we had lunch in a town nearby. This is the sink hole where the river enters the caves…and where we exited from the tour. You can see the the river … can’t you? 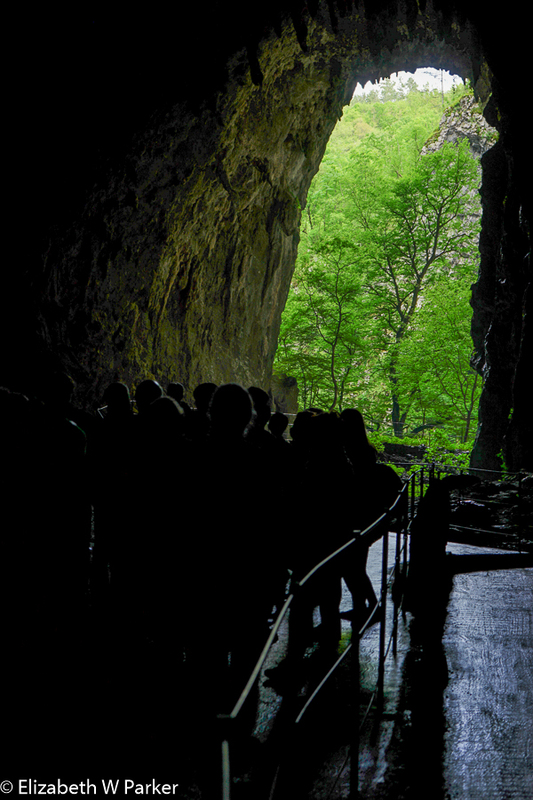 Our next destination was the Skocjan caves, a UNESCO World Heritage Site just 10 minutes from Lipica. Here again our guidebook failed us – failed to tell us that the tours are timed. We arrived about 15 minutes too late for one tour and an hour too early for the next. Oh well. Some of us walked off our lunch by following the walking path around the huge sink hole to view the falls and the site where the river enters the caves. It was an extremely pleasant walk through the woods, filled with wildflowers and the sounds of birds. The sinkhole is impressive! It probably takes the best part of an hour to circumnavigate, something we didn’t have time to do. 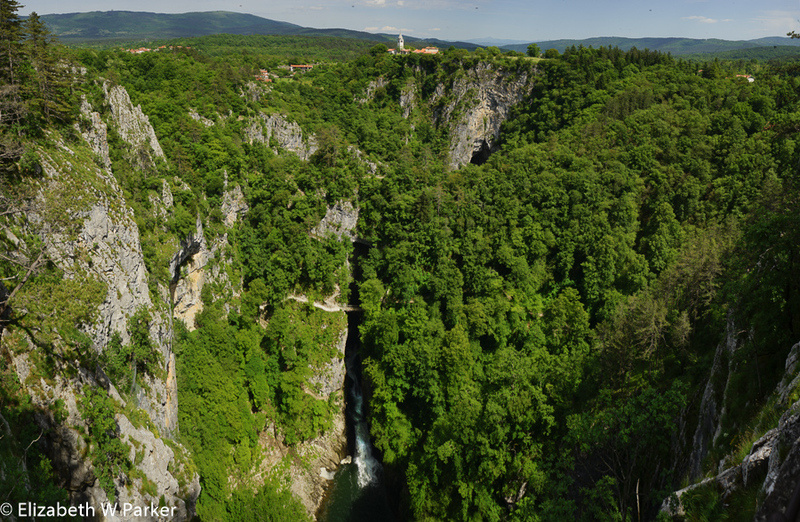 But the first view point actually gave us the view from above – of the same view we would late see from below. Another view of the sink hole. So the final group was ours, a motley United Nations representation to be sure, but a delightful set of companions for experiencing a phenomenal cave system. This visit was a lot of walking, most of it going downwards. The paths were well it and designed to minimize slipping, a good thing since many were wet. The guide was very good. The first part of the tour winds around what they call silent caves, ones through which the water does not flow. The landscape was varied: There had been a collapse in the cave centuries ago meaning that the stalagmites (growing from the ground up) and stalactites (from the ceiling down) were young, mostly just a foot or so in length. We also saw “baby” stalactites just an inch, if that, long. 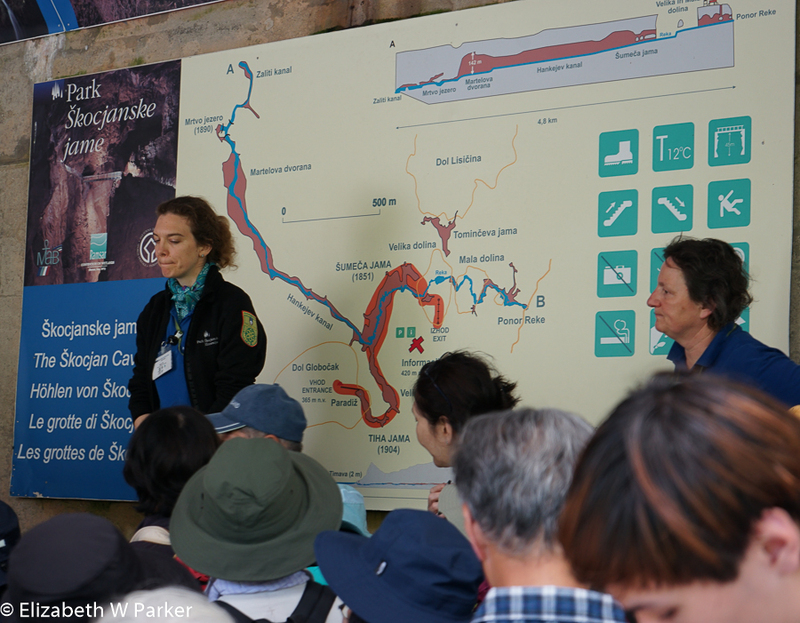 Check out the map behind the guides – it shows the underground portions of the caves. The cave is not lit with colored lights. Still there is color. The most important color is white – the color that indicates that the formations are still growing. 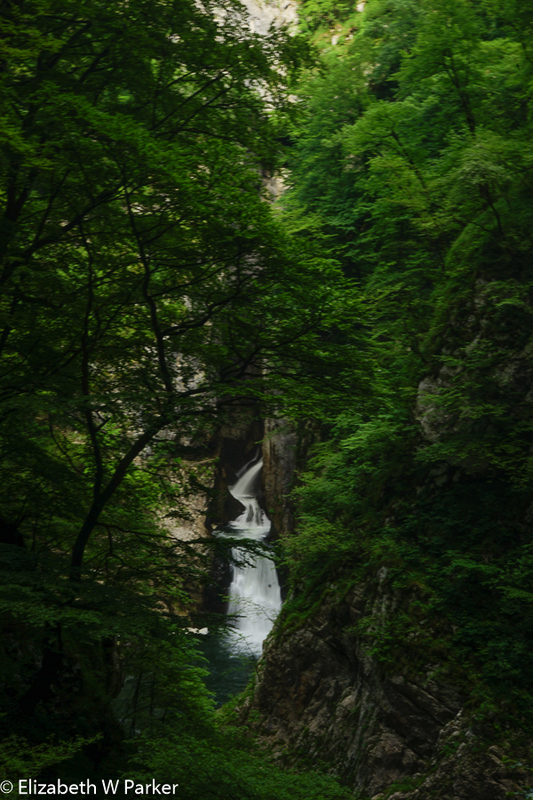 It is cool in the caves, misty and even foggy, especially as you get into the “murmuring” section – the section where the river is flowing. It is dizzying to contemplate how far below you the river is. For the faint of heights, the railing is strong, metal and solid, and the path is mostly wide enough for you to stand back from the edge. 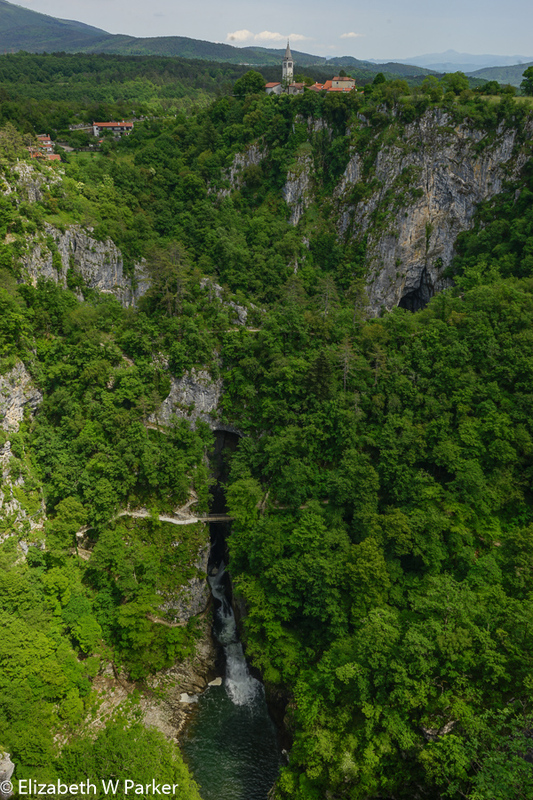 It is a far cry from the old paths and stairways you can see cut into the walls, or the wooden bridges with skinny railings that were once the tourist’s access to the wonders we could see. Memorably etched into my brain was a particular spot where we crossed a bridge. The cavern we were in was 130 meters high and about 300 meters across (and that isn’t the biggest one in this system!). As we approached the bridge, we were coming from a higher place along the wall of the cavern, downwards to the bridge. Lit, as are all the paths, it seemed so delicate, stretched in the infinite of blackness below and blackness above, shrouded by the mist and fog, the sound of the river far below us magnified by the shape of the space. It was awesome – in the absolute literal meaning of that word! In this part of the cave, we saw ancient structures. We saw huge columns where the stalagmites and stalactites met up long ago, but that were still actively growing. We saw long sinuous curtains of rocks, as well as bulbous shapes that curled and twisted, formations nudged into shape as wind through the cave made its contributions. We saw terraced pools, too. Everything so strange and wonderful! By this point in the tour, the noise of the river often made it hard to hear the guide, so exactly how some of the formations were made escaped my ears…but my eyes were full! The exit of the tour – at the bottom of the sink hole. We exited the cave through a tall hole where the river once entered and then we climbed a good way (65 steps they warned us at the beginning) to a cable car that took us almost all the way back up. We skipped the last optional stop planned for our day, a visit to the Predjama Castle, because of the time (it was 6 pm) and instead headed straight for Ljubljana (pronounced Loo-blee-YAH-nah) where we would be staying for the next 2 nights. Keep reading From here we spent a few days in the capitol, Ljubljana.